Hair Myth Number One: You should only wash your hair “X” number of times per week. Fact: only you know how often you should wash your hair depending on your lifestyle. For example, if you work out daily and you sweat significantly from your scalp – wash your hair. If you find yourself sweating at night – wash your hair. 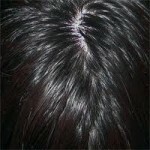 If your scalp gets itchy, your hair looks greasy, or it smells unclean – please wash your hair. The important point is not how often you wash, but what products you choose to shampoo your hair. Some shampoos contain harsh detergents that compromise the natural balance of your scalp and may make it produce more oil because you may be stripping it with products that are too astringent for you. My top recommendations are always the most botanical products that I have been able to find such as Phyto, or John Masters Organics, or Simply Organic. Hair Myth Number 2: You shouldn’t wash your hair before a color service. Fact: Having clean hair prior to a color service is a good thing particularly if you choose to use a gentler color like many ammonia-free or demi-permanent colors. Without ammonia the color may not be able to eat through build-up, oils, etc. What you do want to be careful of is abrading the scalp, but this is always true. You only want to use the pads of your fingers, and never your nails when washing your hair so that you don’t scratch and harm the scalp. Hair Myth Number 3: You should wait “X” number of days to wash your hair after a color service. Fact: The only reason to wait is to prolong the effects of a gorgeous in salon blow-out. It’s nice to have your hair styled by someone else and there is no harm in trying to stretch it out as long as you can. Again, only you know how often you should wash your hair. Hair color is not going to last longer the longer you wait to shampoo – if it’s going to wash out it’s going to happen because your hair is porous and it’s natural to lose pigment over time. Until next time, I hope this blog post has shed some light. If you have specific questions please leave a comment below and I’ll do my best to answer.